See a brief overview of the essential elements of LRSS, a review of the available materials, information about how to get started, and feedback from those who use it. An easy way to understand LRSS and a good tool to use when inviting parishioners to participate. Available for FREE. 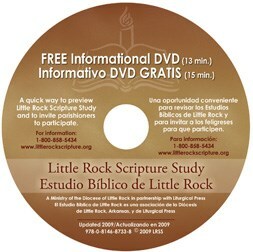 In addition to the Informational Video, we suggest you also order the INTRODUCTORY PACKET (includes a Coordinator's Manual and Acts of the Apostles Study Set). Vea una breve explicación general de los elementos del EBLR, un repase los materiales disponibles, vea la información de cómo comenzar y las experiencias de aquellos que ya lo han usado. Esto es un métedo rápido para tener una idea el EBLR y un gran reposo para usar cuando inviten a los feligreses a participar. GRATIS.